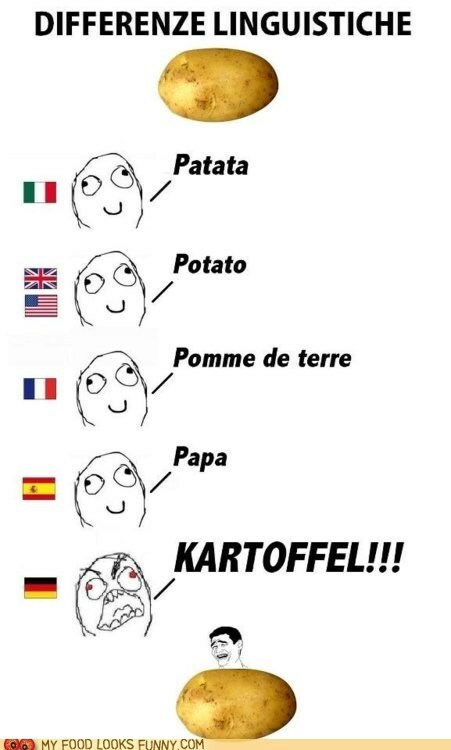 Realistically – whatever language you speak, and whatever country you’re from – the potato been there through thick and thin. From its origins high in the Andes, to its subsequent travels throughout Europe, it has been a staple in numerous civilizations and cultures, and vilified in others. Due to its being part of the Solanaceae family, (to which Nightshade also belongs) it was blamed for many of societies ills, including famously by the French… leprosy. It has been so relied upon as a food source that in 1845, when the infamous Irish Potato Famine took 50% of the potato crop of Ireland, 2 million Irish people just disappeared – 25% of the population. 1 million died from the issues which came from the famine and another million emigrated to wherever they might start over… Dan Quayle couldn’t spell them… McDonald’s wouldn’t be what it is without them — the undeniable fact is –the history of mankind has been shaped by this humble little spud. Here at the Light house – we like potatoes. We enjoy many different varieties, particularly the slightly more waxy and flavorful Yukon varieties – so when we saw that the local farmstand had Yukon seed potatoes in stock, (and we realized that we had a coupon for that particular farmstand – what can I say, we’re cheap! ), we loaded up Thing 1, Thing 2, and Thing 3 and made a trip over to pick up somewhere in the vicinity of 20 pounds of seed potatoes. Did I mention that we like potatoes? We’ve grown potatoes in the past on our property, and they did ok – the size was somewhat hampered, but we were able to get some very delicious, extremely flavorful Yukon’s two years ago from the plot out back, and being that Spring has now officially gotten started here in Salem – the process began to prepare for our potato crop this year. Shannon started by cutting the seed potatoes into manageable chunks with a couple of eyes a piece, and let them sit a couple of days to “cure”. Essentially to dry out, and firm up a bit and let the eyes get somewhat set in their growth now that the potato itself was damaged. This basically consisted of leaving them out on the counter to air dry and firm up. You technically don’t even need seed potatoes… Now, store bought potatoes are sprayed with a retardant to prevent eye growth, but they will grow over time and can grow well given the right conditions (TRY IT!) – but if you want to guarantee growth – get yourself some seed potatoes. 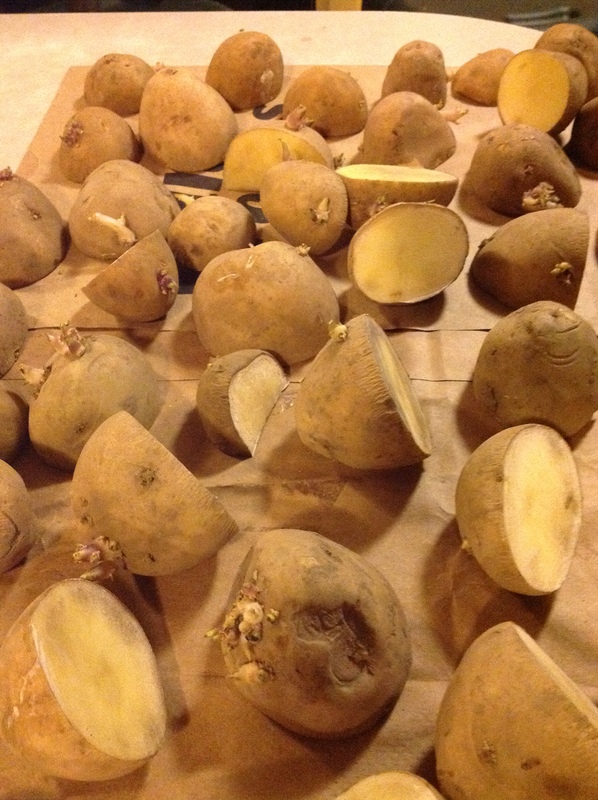 Now we’ve got 20 pounds of cut up seed potatoes (this picture isn’t all of them) ready to go into the ground — BUT WAIT! THERE’S MORE! We are going to experiment a bit this year, because it turns out, growing potatoes is easier than you might think – those of you that live in apartments and condos, you can do this too – Shannon came across two articles in our back issues of Mother Earth News on growing potatoes in a barrel rather than in the ground, so we’re going to give it a shot. 2) Allegedly the yield is greater, because as the potatoes grow up, you cover them again with compost/mulch/sawdust and they will put out a new potato cluster under that layer, keep layering, keep growing! 3) No digging? Say what?! Just tip and sift! 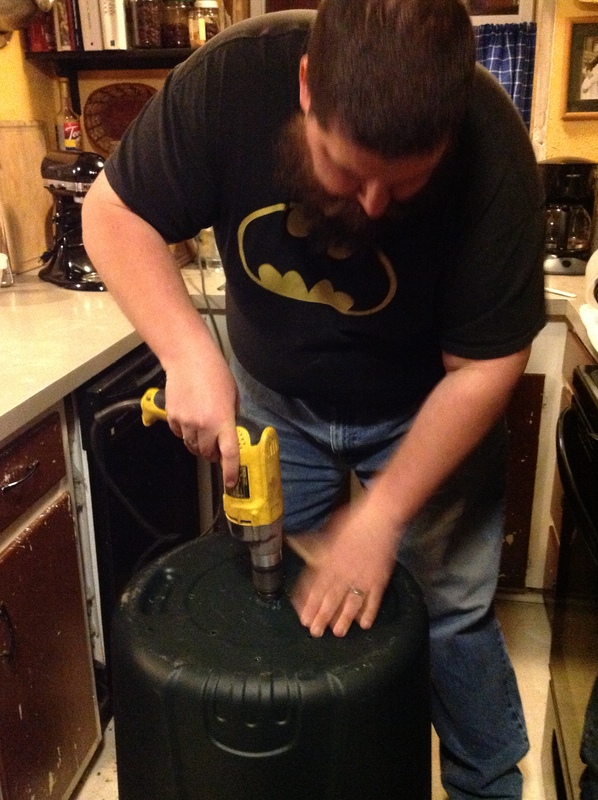 Tonight we prepped the two 32 gallon garbage cans we’re going to use for this purpose by drilling drain holes in the bottom of the garbage can. All that is left to do now is get the garbage cans to a nice sunny place, put them up on bricks – lay down a layer of compost/mulch, plant the potatoes, lightly cover them and wait. By the end of the season we should be up to our elbows in delicious potatoes! !